National Weather Service officials have determined that it was not a tornado that caused massive damage, but rather 85 mph straight-line winds that hit Gloucester County, New Jersey during severe storms on Tuesday night. Investigators looked for patterns in the damage that would have shown the circular rotation of a tornado. Instead they called it a macroburst of high winds. Trees were toppled, power lines down, and traffic snarled. 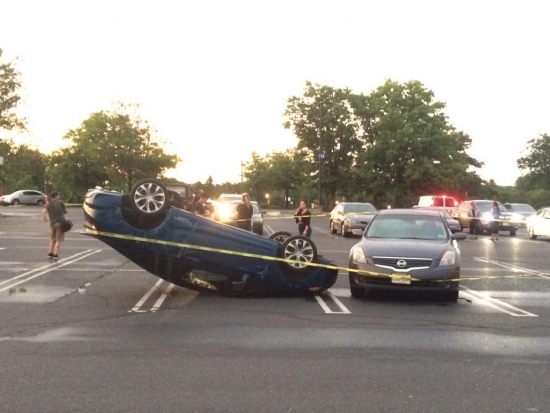 A car at the Deptford Mall even flipped over. Gusts of over 70 mph were recorded across the area. 300,000 were still without power in PA, NJ, and DE as of this afternoon. Pope Francis greeted Mayor Nutter, Archbishop Chaput, and other members of the Philadelphia delegation during his weekly general audience in front of St. Peter's Basilica in Vatican City on Wednesday. Mayor Nutter said that when the Pope approached them he was smiling and had three fingers up, for three months to go before he arrives in Philadelphia. After their audience with Pope Francis, the delegation and World Meeting of Family organizers held a luncheon for international journalists highlighting Philadelphia as a global destination. Everyone is excited to show off the city come September.